Aquarium Setup: Zebrasoma gemmatum (Spotted tang) must be given a lot of space to do well. They need many hiding spots and acropolis coral skeletons are especially appreciated. Strong water movement is vital. pH should be 8.0-8.4. Temperatures should ideally be in the mid-seventies or low eighties F. High oxygen levels are important. 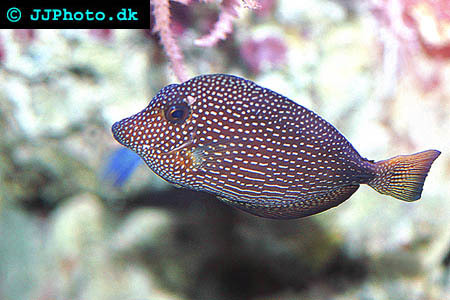 Food: Zebrasoma gemmatum (Spotted tang) primarly eat benthic algae. A good aquarium diet includes meaty and vegetable materials in small portions. Spotted tangs can store fat in body cavities, and periods of non-feeding are natural. Breeding: We do not have any information about how to breed Zebrasoma gemmatum (Spotted tang) in aquariums.